Semi-trucks dominate the traffic in this part of Denver’s industrialized north side. 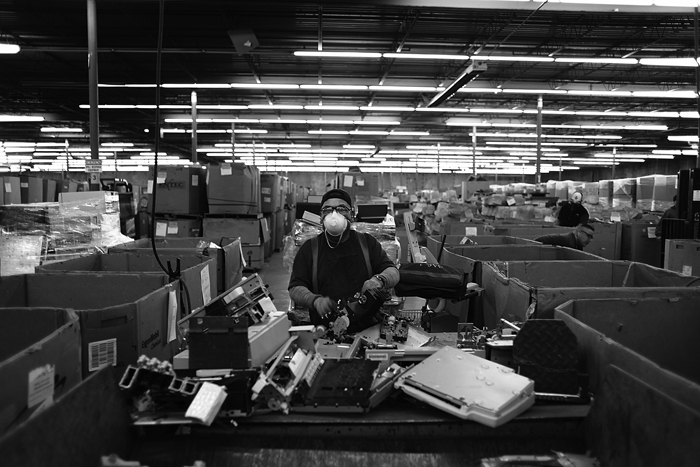 Inside a dusty100,000 square foot warehouse, a line of around 20 workers disassembles electronic goods. They demolish electronic products ranging from 50’s era bakelite TV consoles to modern day hi-res flat screen monitors. Behind them, hi-los scoot across the concrete floor carrying bins of sorted electronic components to waiting semi-trailers. This is Metech Recycling, an e-waste recycler that differs from other recyclers in the area. Conscientious consumers brought their electronic refuse to Metech because they know it will be recycled responsibly. They are certain it won’t be discarded in a municipal landfill or dumped on a poor nation in, say, West Africa, causing polluted air, aquifers, and soil. Metech provides this guarantee as the basis of their business, and with the growth in disposable commodities causing environmental concern, it’s an important guarantee. Americans buy a lot of new technology. According to the Consumer Electronics Association, we spent $180 billion on electronic gadgets last year. They seem to make our lives easier, save time, and offer more ways to communicate. Consequently, Americans also trash a lot of technology: according to the Environmental Protection Agency (EPA), we produced 3.1 million tons of e-waste in 2008.